The Decatur PATH identifies 9.2 miles of bicycle and pedestrian trail connectivity opportunities primarily within the city limits of Decatur. 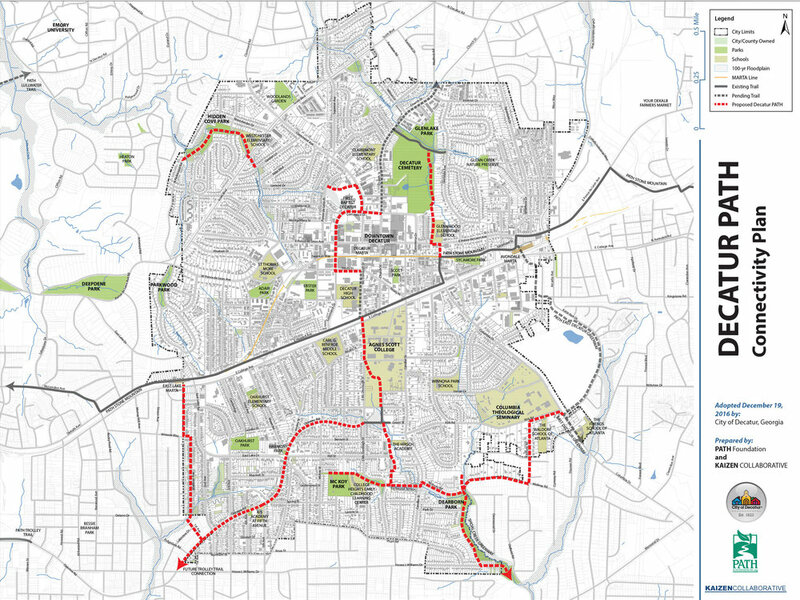 The plan presented achieves the goals of connecting the existing Stone Mountain Trail, the downtown business district, city parks, neighborhoods, and major visitor and employment centers. Converting part of Oakview Road to a neighborhood greenway will slow traffic, promote muscle-powered travel, and favorable affect property values and neighborhood cohesion. 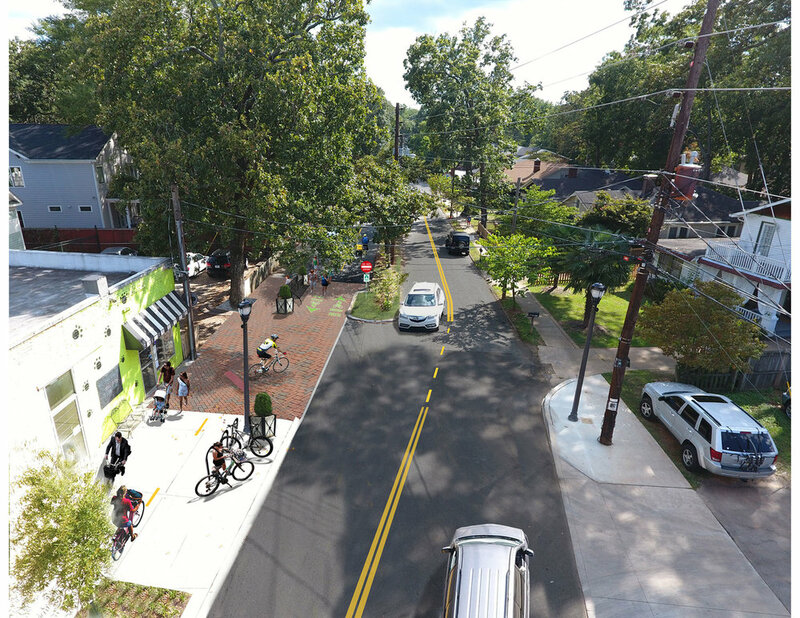 Repurposing part of Commerce Drive into a protected cycle track will encourage bicycle ridership from north Decatur neighborhoods into the commercial district. 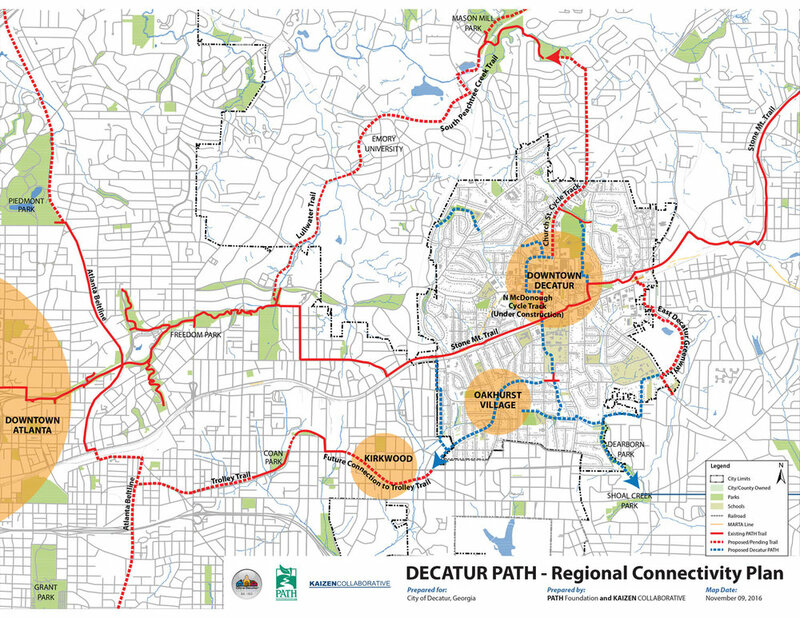 The Decatur PATH regional connectivity plan visions the link into the future Trolley Trail and connectivity to key points of interest and destinations such as downtown Kirkwood, the Atlanta BeltLine, and downtown Atlanta. Proposed Trolley Trail at Kirkwood. Proposed connection to the newly constructed two-way cycle track along the west side of McDonough Street. Proposed crossing of East Lake Drive with custom crosswalk and enhanced pedestrian mixing zones with improved pavers. Proposed modification of northern bound lane for bicycle-pedestrian greenway signing and markings, landscape bulb-outs to restrict entrances to only local traffic and on-street parking. Proposed removal of existing north bound lane along Oakview Road between 5th Avenue and Spring Street. This document suggests segmenting the plan into ten phases and constructing all phases proposed within five years at a total cost of around $8.8 million (2016 construction costs).